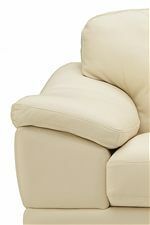 Lay back and relax on the wide seat of this plush leather loveseat, and enjoy optimal relaxation. 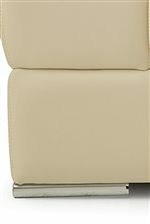 Designed in a clean, casual style, this loveseat has a comfortable, minimalist look created by wide, sloped pillow arms, thick, contrast stitching, boxed-edge cushions, and just-visible flat block feet. When you sit down in the relaxed seat of this loveseat, your entire frame will be cushioned by the resilient feel of high density foam and the stable support of interwoven elastic webbing. 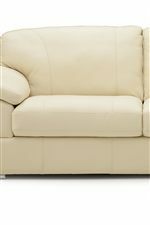 This two-seater loveseat is also the perfect size for one person to sprawl out and relax with a book or favorite film. The Acapulco Casual Loveseat with Pillow Arms by Palliser at Jordan's Home Furnishings in the New Minas, Halifax, and Canning, Nova Scotia area. Product availability may vary. Contact us for the most current availability on this product. The Acapulco collection provides you with upholstery for building your own private getaway, plush, relaxing, and styled in a clean, casual design. Furnish your home with a soft leather chair, sofa, or loveseat from the Acapulco collection, and you're guaranteed an exceptional seating comfort that will last through years of use. These pieces are styled with a minimalist silhouette and casual adornments like wide, sloped pillow arms, t-back cushions, and sleek, flat block feet. The relaxed back of these sofas will gently cushion your body with resilient and comfortable high density foam and the stable, durable support of a reinforced wood frame and premium elastic, webbed suspension. The Acapulco collection is a great option if you are looking for Casual furniture in the New Minas, Halifax, and Canning, Nova Scotia area. Browse other items in the Acapulco collection from Jordan's Home Furnishings in the New Minas, Halifax, and Canning, Nova Scotia area.